I’ve become slightly obsessed with moths recently. 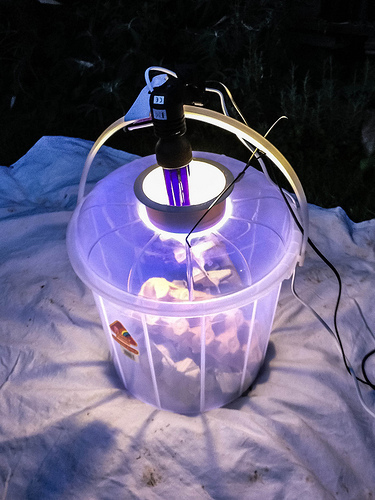 I’ve tinkered over the last few years with a homemade moth trap but wasn’t having much success so I decided to try and refine it. 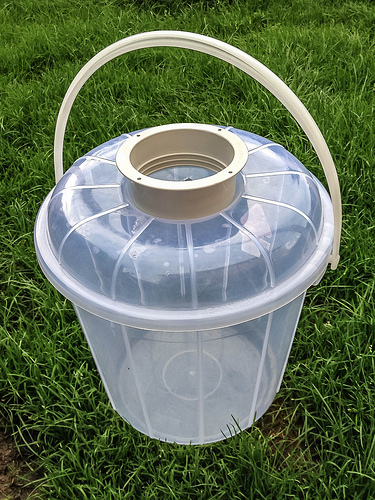 I found a plastic bucket in the local bits and bobs shop that seem the right size. I cut out a hole in the middle of it to allow the moths in. This would also have made it easy for rain to fall in so I added a piece of old tube I had laying around and siliconed it in place. 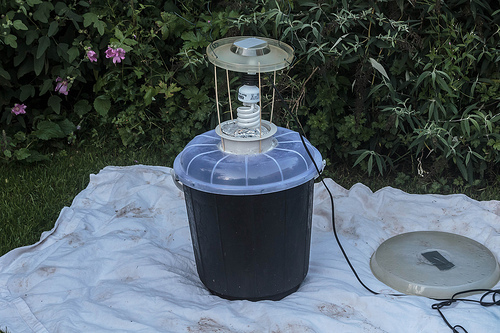 The moths weren’t staying so I painted the bucket black to try and help them settle. This seems to have helped retention quite a lot. 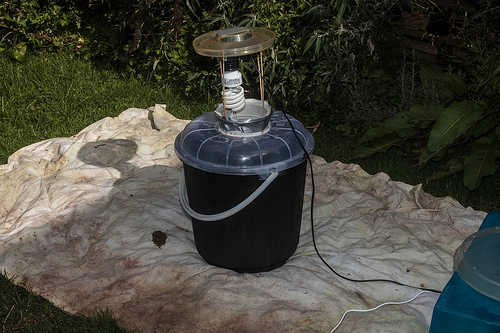 I’ve also added a rain guard made from an old bird feeder tray to stop the bulb getting wet in the lovely Welsh weather. As I didn’t get any complaints I’m now trialling a new light. 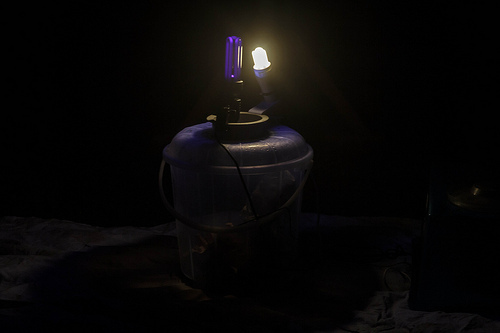 It is a 100w reptile light, it gives out a lot of UV. Results seem pretty good. 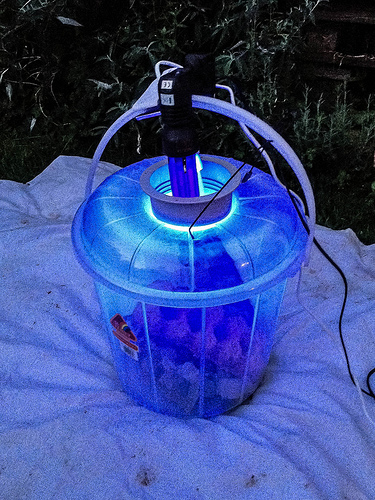 It seems to work really well and I’ve caught some amazing moths (which I will post later). Easy to make and cheap! Well worth a try. The ready made transparent collar is a winner with this design. I had to make mine from polycarbonate. Is the trap working well? 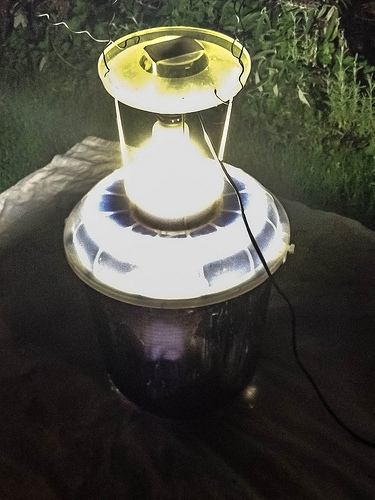 I’m interested in the reptile lights as they’re a bit cheaper than the 20w CFL that I use (which I keep breaking and having to replace). Hi, the trap seems to work well. The reptile light is great, get one that does 10%uv . Numbers not as high as a mercury vapour but I can’t run one of those as we are too built up.